I want you to meet our friends, Dave and Betsy. We first met Dave and Betsy in northern New Jersey at the church we were attending while my wife, Katie, and I were ministering in the NYC area. Perhaps it was Dave’s curiosity and zest for life, or his enjoyment of automobiles that forged a friendship, but one thing for sure was our common passion to follow Jesus Christ. Through our many adventures we have spent hours together. Thoughtful conversations have explored our values; let us share our dreams, disappointments, and desires to bring glory to God through our lives and marriages. I’d like to share one of our conversations from earlier this year. Q: Did I hear you right that you’re planning to give away all of your money to charity? How did you come to this conclusion? I have had a successful career and my savings have grown nicely over the years. I feel that I’ve been tremendously blessed and I’d like to give back and help other people who have not been so fortunate. Q: But what about your family? Don’t you want them to inherit your wealth? I helped all my children with college and getting started with their lives and homes. They’re all grown adults now and taking care of themselves quite nicely. We have also planned some end of life provisions for them, so we are confident they will do well. Q: So do you have a foundation or corporation for giving? About half of my giving is through a charitable trust and the rest through a donor-directed fund. These are great tools for donors to support existing charities. I enjoy giving to established nonprofits, like The Navigators, where they have an established ministry with people and programs in place to make a difference in world. Q: A number of wealthy people have signed “The Giving Pledge” to give half of their wealth away. Why would you want to donate 100 percent of yours? Why not? People have needs today; their needs won’t wait until I die. It has given me great joy to meet students in schools in Haiti and Guatemala that I helped to build. In Jordan my heart was broken as I saw first hand the plight of refugees. Our gifts are helping a little to make a difference. Q: You mention schools and students. What other areas of interest do you have? With so many opportunities, I can’t do everything. I focus primarily on education, clean water, and disaster recovery. Locally, I help men recovering from addictions through my giving and also by teaching a weekly Bible study. Betsy and I have worked together for over 12 years building homes, and rebuilding schools in the Guatemala City garbage dump. I also give to help students through scholarships at Cornell and Carnegie-Mellon, where I studied. 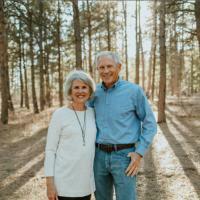 Dave and Betsy’s journey of generosity has led them to both live and leave a legacy. They are experiencing joy in giving it all away to a prayerfully chosen group of non-profits, including The Navigators. Jesus’ words come to mind: “It is more blessed to give than it is to receive” (Acts 20:35). A key take away is no matter how much we have to give—God will bless it! What tangible ways in your life can you practice generosity today? Click here to find out more about NavLegacy.